The word “bead” takes its root from a combination of the Anglo Saxon words “bidden” (to pray) and “Bede” (prayer). The word Bede, when spelled b-e-d-e, means "to beg." Saint Augustine said,"humans are beggars before God." So "beggar beads" might well be called prayer beads. 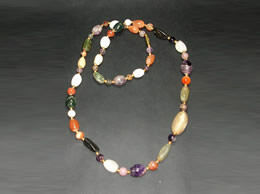 Nowadays beggar beads are being used in the form of fashion accessory. These beggar beads have been made using many special stones like Amethyst, Rose Quartz, Ruby, Agate, Quartz Crystals these stones have been hand cut with precision and polished to suit your needs. These beggar beads are used in talismans to protect the wearer against evil; it is also used as amulets to bring wisdom. It also helps in reducing anxiety. Beggar beads have played an important role since a very long time now.